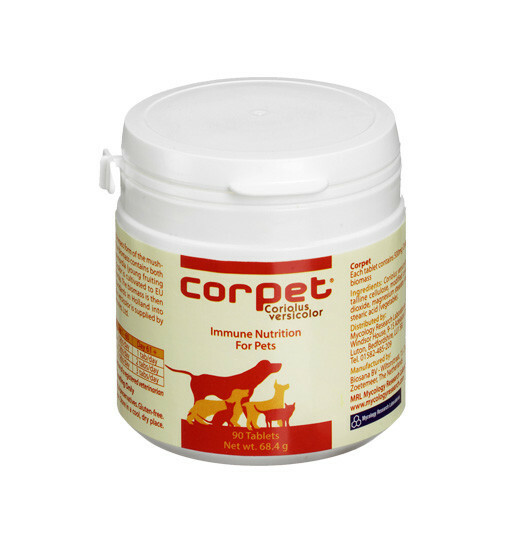 Corpet (Coriolus versicolor) supports the immune system in your pet, small animals and horses. Certified Organic: The fungal biomass Coriolus versicolor that comprises Coriolus-MRL is certified 100% Organic in the United States by Quality Assurance International (Certificate No. 103491-A). Mushrooms legendary effects on promoting good health and vitality and increasing a body’s adaptive abilities have been supported by recent studies. These studies suggest that Mushrooms are probiotic – they help a body strengthen itself and fight off illness & cancer by maintaining physiological homeostasis – restoring your pet’s bodies balance and natural resistance to disease. The compounds they contain have been classified as Host Defense Potentiators (HDP) which can have immune system enhancement properties( boost immune system! ). 15% off price per bottle for orders of 4 bottles or more! Price will be adjusted when your order is processed offline. Copyright Gourmet Mushrooms 2016 - 2018 All Rights Reserved..